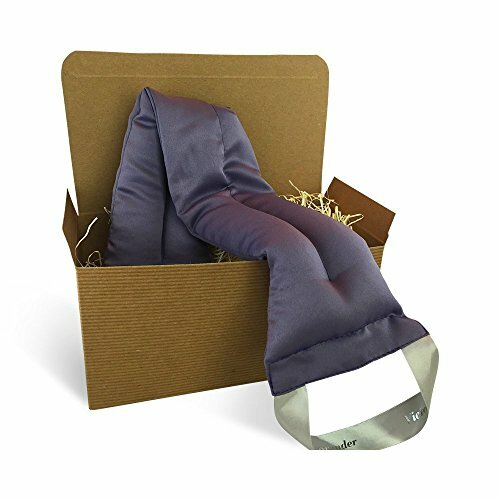 Our exclusively designed microwaveable NECK WRAP is made to place around your neck to help relax tensions and soothe sore neck muscles from sitting too long at a computer or extra physical exertion. Filled with organic flax seed and generous amounts of organic French Lavender. Our neck wrap is a truly soft, relaxing neck wrap that you can give as a gift with great confidence. It provides the ultimate in pain and stress relief. After heating in the microwave the soothing warmth will melt away the pain, tension, and stiffness from your neck leaving you feeling relaxed, renewed and refreshed. LUXURIOUS: Each neckwrap is handsewn from the finest silky soft material and hand filled with organic flax seed and lavender from our private farm in Oregon. COMFORTABLE: It conforms to the contours of your neck without being too heavy. AROMATHERAPY: Our all-natural lavender is known to help aid insomnia and relieve stress plus a truly aromatic scent. HEAT IN MICROWAVE and use to melt away tension. Backed by our 100% money-back guarantee of satisfaction, just click the Add to Cart button at the top of this page to buy with confidence.